On October 15, voters in Kyrgyzstan turned out to vote in what would ultimately be the first peaceful transfer of power between elected presidents in the country - and Central Asia - since the fall of the Soviet Union. Following protests in 2005 and 2010 that led to the ouster of the presidents at the time, a new constitution was passed in 2010 introducing a strong parliament to better place checks on the presidency. For the 2017 presidential election, incumbent president, Almazbek Atambaev, was barred from running again due to constitutional term limits. His prime minister, Sooronbay Jeenbekov, stepped down to run as the Social Democratic Party of Kyrgyzstan (SDPK)’s presidential candidate. Initially, 59 candidates filed to run for president; however, the Central Election Commission eventually invalidated a number of candidates due to not obtaining enough signatures or failing the Kyrgyz language test needed to officially stand on the ballot. One of the main opposition candidates from the Ata-Meken (Fatherland) party, Omurbek Tekebaev, was ultimately sentenced to eight years in prison on corruption charges, which the party alleges were filed to keep him from running for president. Ultimately, 13 candidates appeared on the November ballot; most ran as independent candidates. For this pivotal and important election, local citizen observer group the Coalition for Democracy and Civil Society (or the Coalition) deployed 60 long-term observers across all 57 districts of the country to assess the electoral environment, including preparations and functions by the Central Election Commission (CEC) and territorial election commissions (TECs), as well as the campaign period. LTOs found that most CEC processes were transparent and open to observation, yet others, such as verifying signatures for candidates, were not. They assessed gender and party composition of TECs over the pre-electoral period, as well as quorum for commission meetings. During the campaign period, the Coalition’s LTOs looked at the number of party/candidate headquarters and billboards, and collected data on incidents of pressure, threats or vote-buying. LTOs also monitored the use of state resources for campaign purposes, recording details of situations and instances where this occurred. During the pre-election period, the Coalition also used sampling methodology to assess changes to the voters list. The Coalition drew a sample of 350 polling stations that LTOs visited twice (for the first time when the voters list was posted for the public to check, and the second time a few days before election day when the voters list was closed). Using reports submitted by LTOs, the Coalition was able to determine that there was a .64% increase in the number of people on the voters list, but were also able to note that there were polling stations where voters lists were not posted on time. On election day, the Coalition deployed 1,000 observers to a random, representative sample of 500 polling stations across the country to conduct a parallel vote tabulation (PVT). Observers reported at assigned times throughout election day and night via structured SMS messages to a central database. This was the Coalition’s first use of SMS reporting for election observation, and they successfully achieved a 100% response rate from all 500 sampled polling stations, a result of multi-level training, preparation and testing of STOs. 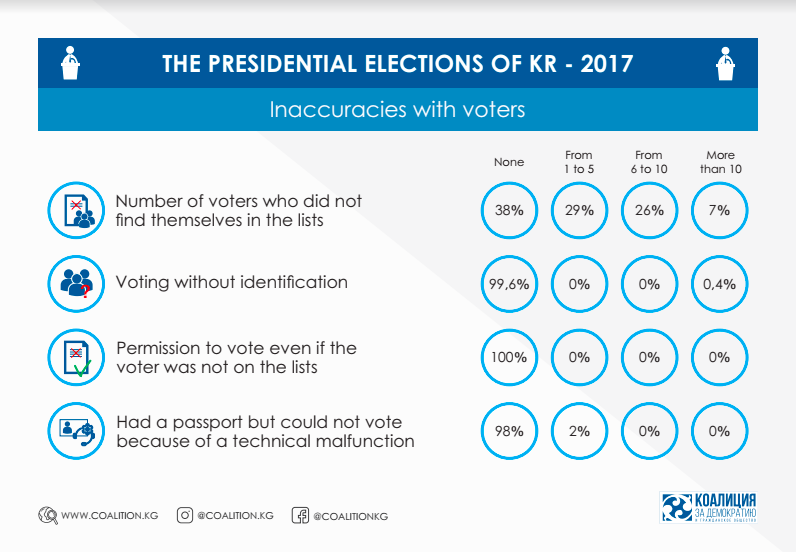 The Coalition released reports and infographics on their findings from the opening, voting and counting processes, assessing the timely opening of polling stations, polling station staff’s adherence to procedures, voter turnout throughout the day, and any obstacles observers themselves may have faced. Following counting processes, observers texted in the presidential results from their assigned polling stations. The Coalition found that the PVT results were consistent with the official CEC results within a small margin of error, with SDPK candidate Jeenbekov winning outright in the first round with more than 50% of the vote. In their preliminary report released on the day after election day, the Coalition elaborated on their election day findings, emphasizing that while the process was largely followed according to procedure, there were some violations and problems with the quality of the voters list. They also highlighted a number of problems during the pre-election period, including that the incumbent president’s campaign for the SDPK candidate “seriously restricted the freedom of competition between candidates.” They also found instances of state employees campaigning for candidates and biased campaign coverage of the national television station, representing a misuse of administrative resources. The Coalition also noted that, for the first time in their history of observation activities, new rules made it harder for their observers to receive accreditation. In addition to sharing infographics and findings on Facebook, the Coalition livestreamed their call center on election day on Youtube, which showed the work of call center volunteers, as well as findings from observers on the voting process throughout the day. This innovative practice demonstrated the level of sophistication, rigor, and credibility of the Coalition’s work to the general public, and provided a different medium through which they could their findings.